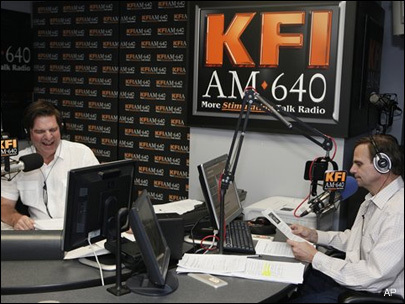 KFI-AM’s John and Ken Show has Latinos demanding the pair’s ouster. The Los Angeles California talk duo read an immigration rights advocate’s phone number on the air reportedly prompting a flood of hate calls to the man. A protest at the station’s studios ensued. KFI-AM issued a statement standing behind John Kobylt and Ken Chiampou’s free speech rights. So far Verizon and AT&T have pulled their commercials from the program. Latino activists say they will continue to pressure other advertisers to leave the show. Posted on October 15, 2011, in Broadcasting, media, Radio, Talk and tagged broadcasting, kfi, media, radio, talk. Bookmark the permalink. Leave a comment.